Could you imagine a day without your smart phone, not only it but it is making the users also smarter day by day. Amazing you can surf the internet ,listen to music and text your friends with something that fits in the palm of your hands .None of the things would be possible without chemistry and every time you use your smartphone you are putting chemistry into action. 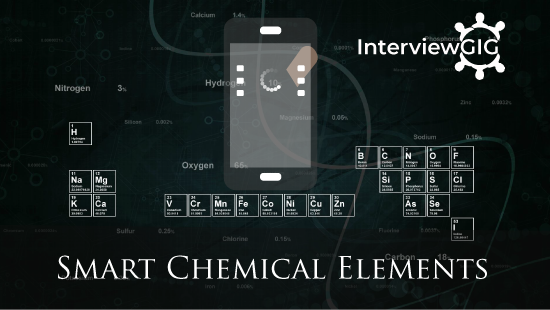 If you are wondering what chemistry has to do with smart phones just look at the periodic table of the 83 stable elements, at least 70of them can be found in smart phones. An average smart phone contains up to 62 different types of metal. Single I-phone contains 8 different rare earth metals. Phone cannot vibrate without neodymium and dysprosium. Rare earth metals are used in electronic devices. When shopping for a smart phone the single most important feature that people look for is display. The following method is used where potassium salts, sodium ions in a glass migrate large number of potassium ions are squeezed. This compresses the glass and makes it strong and finally Indium Tin oxygen puts the touch in touch screen. Currently, gorilla glass is used in many smart phone devices. Gorilla Glass is composed of an oxide of silicon and aluminum also called aluminosilicate glass along with sodium ions. Praseodymium is a soft malleable, silvery –yellow metal. It is a member of the lanthanide group of periodic table of elements. Praseodymium is used in lighter flint and in the welders and glass blowers goggles. It can be used in air craft engines. It is rare earth metals found in cerite, gadolinite, and monazite. It is used in low – energy light bulbs and mercury lamps. Terbium used in laser devices. Yttrium on the early oxidation stages of alumina formers. It relies on the elucidation of processes occurring in unstable alumina. It can be used to treat some cancers, such as liver cancer. It is used in white led lights. Whole – brain radiation therapy. Gadoliniums are used in green phosphors in color television picture tubes. It can be used in intravenous radio contrast agents in magnetic resonance imaging. Indium compounds can cause a new and unique interstitial pulmonary disease. First report on lethal lung injury in a ITO worker. Indium is used to make indium tin oxide, which is an important part of touch screen, flat screen TVs and solar panels. It is used to dope Germanium to make transistors. An oxygen play a major role in the body is that is used to oxidize our food in the process of cellular respiration thus releasing energy. It can be used as antifreeze and to make polyester the precursor to poly vinyl chloride. It is used as steel industry. During oxidation process some amount of oxygen dissolved in steel and affects the properties. Europium atom by absorption of UV radiation can result in specific energy level transitions within the atom creating an emission of visible radiation. Doped plastic has been used as a laser material. Dysprosium has a high thermal neutron absorption cross section that it is very good at absorbing neutrons. Silicon is one of the most useful elements in mobile phone. It is used for electronic devices because it is a very special element properties (For example: semiconductor).Typical fillers used in FR4 PCBs are Silica and aluminium silicate. Most is used to make alloys including aluminium-silicon and Ferrosilicon (iron silicon). In phone, Gorilla glass is composed of an oxide of silicon and aluminium. It is also called aluminosilicate glass-along with sodium ion. Lithium ion is a type of rechargeable battery in which lithium ions move from the negative electrode to the positive electrode during discharge and back when charging. It is also used in some non- rechargeable batteries for things like heart pacemakers, toys and clocks. Cobalt is a brittle, hard, silvery – grey transition metal with magnetic properties similar to those of iron .Cobalt is present in meteorites. It is used in medicine. It’s not radioactive and doesn’t hurt the patient, but it can be used as a trace element to find things like cancer. These are used in many modern products includes inks ,rubber, steel, pencils. Carbon compounds are useful for petroleum and plastics. It is a soft, malleable, and ductile metal with very high thermal and electrical conductivity. A freshly exposed surface of pure copperhas a reddish-orange color. Copper sulfate is used widely as an agricultural poison and as an algaecide in water purification. Copper compounds, such as Fehling’s solution, are used in chemical tests for sugar detection. Copperis used in electrical equipment such as wiring and motors. This is because it conducts Both Heat and Electricity Very Well, And Can Be Drawn Into Wires. Silver is a soft, white, lustrous transition metal, it exhibits the highest electrical conductivity, thermal conductivity, and reflectivity of any metal. Silver is used to make mirrors, as it is the best reflector of visible light known, although it does tarnish with time. It is also used in dental alloys, solder and brazing alloys, electrical contacts and batteries. Silver paints are used for making printed circuits. Silver has antibacterial properties and silver nanoparticles are used in clothing to prevent bacteria from digesting sweat and forming unpleasant odours. Silver threads are woven into the fingertips of gloves so that they can be used with touch screen phones. Goldis a soft, yellow metal. Like all other metals, gold is also highly malleable and ductile. Moreover, gold is able to conduct both electricity and heat rather easily. Dentists sometimes use gold alloys in fillings, and a gold compound is used to treat some cases of arthritis. Gold nanoparticles are increasingly being used as industrial catalysts. Poly Vinyl acetate, which is used to make PVA (for glue, paint and resin), is made using a gold catalyst. It resists corrosion, even when red hot, so is used in toasters and electric ovens. Nickel is used as a catalyst for hydrogenating vegetable oils. Adding nickel to glass gives it a green color. It is a soft silvery metal that tarnishes in air. The metallic form is bright, silvery, hard and brittle; the non metallic form is a grey powder. Antimony is a poor conductor of heat and electricity; it is stable in dry air and is not attacked by dilute acids or alkalis. Antimony and some of its alloys expand on cooling. The major use of antimony is in lead alloys- mainly for use in batteries adding hardness and smoothness of finish. Arsenic occurs in many minerals, usually in combination with sulfur and metals, but also as a pure elemental crystal. Arsenic is a metalloid. It has various allotropes, but only the gray form, which has a metallic appearance, is important to industry. Arsenic is a well-known poison. Arsenic compounds are sometimes used as rat poisons and insecticides but their use is strictly controlled. Arsenic is used as a doping agent in semiconductors (gallium arsenide) for solid-state devices. It is also used in bronzing, pyrotechnics and for hardening shot. Arsenic compounds can be used to make special glass and preserve wood. Phosphorus is essential for life. Phosphates(compounds containing the phosphate ion, PO43−) are a component of DNA, RNA, ATP, and phospholipids. Elemental phosphorus was first isolated from human urine, and bone ash was an important early phosphate source. Phosphorus is used in flares and incendiary devices. Red phosphorus is in the material stuck on the side of matchboxes, used to strike safety matches against to light them. By far the largest use of phosphorus compounds is for fertilizers. Ammonium phosphate is made from phosphate ores. The ores are first converted into phosphoric acids before being made into ammonium phosphate. Phosphorus is also important in the production of steel. Phosphates are ingredients in some detergents, but are beginning to be phased out in some countries. This is because they can lead to high phosphate levels in natural water supplies causing unwanted algae to grow. Phosphates are also used in the production of special glasses and fine chinaware. Galliumis a soft, silvery blue metal at standard temperature and pressure, a brittle solid at low temperatures, and a liquid at temperatures greater than 29.76 °C (85.57 °F) (above room temperature, but below the normal human body temperature. It is also used in red LEDs (light emitting diodes) because of its ability to convert electricity to light. Solar panels on the Mars Exploration Rover contained gallium arsenide. It has important uses in Blue-ray technology, mobile phones, blue and green LEDs and pressure sensors for touch switches. It is a soft, silvery white metal with a bluish tinge, known to the ancients in bronze, an alloy with copper. It takes a high polish and is used to coat other metals to prevent corrosion, such as in tin cans, which are made of tin-coated steel. Alloys of tin are important, such as soft solder, pewter, bronze and phosphor bronze. A niobium-tin alloy is used for superconducting magnets. Lead is a bluish-white lustrous metal. It is very soft, highly malleable, ductile, and a relatively poor conductor of electricity. It is very resistant to corrosion but tarnishes upon exposure to air. Lead isotopes are the end products of each of the three series of naturally occurring radioactive elements. Lead is still widely used for car batteries, pigments, ammunition, cable sheathing, weights for lifting, weight belts for diving, lead crystal glass, radiation protection and in some solders. It is often used to store corrosive liquids. It is also sometimes used in architecture, for roofing and in stained glass windows. It is non metallic and tetravalent making fourelectrons available to form covalent chemical bonds. Carbon in the form of charcoal (from wood) and coke (from coal) is used in metal smelting. It is particularly important in the iron and steel industries. Magnesium is the ninth most abundant element in the universe. Magnesium is the eighth most abundant element in the Earth’s crust and the fourth most common element in the Earth (after iron, oxygenand silicon), making up 13% of the planet’s mass and a large fraction of the planet’s mantle. It is the 3rd most abundant element dissolved in seawater, after sodium and chlorine. Magnesium is the eleventh most abundant element by mass in the human body and is essential to all cells and some 300 enzymes. Magnesium ions interact with polyphosphate compounds such as ATP, DNA, and RNA. Hundreds of enzymes require magnesium ions to function. Magnesium compounds are used medicinally as common laxatives, antacids(e.g., milk of magnesia), and to stabilize abnormal nerve excitation or blood vessel spasm in such conditions as eclampsia. These alloys are useful in aero plane and car construction. Magnesium is used in products that benefit from being lightweight, such as car seats, luggage, laptops, cameras and power tools. It is also added to molten iron and steel to remove sulfur. As magnesium ignites easily in air and burns with a bright light, it’s used in flares, fireworks and sparklers. It is the third-lightest halogen, and is a fuming red-brown liquid at room temperature that evaporates readily to form a similarly coloured gas. it is toxic. Bromine is used in many areas such as agricultural chemicals, dyestuffs, insecticides, pharmaceuticals and chemical intermediates. Bromine compounds can be used as flame retardants. They are added to furniture foam, plastic casings for electronics and textiles to make them less flammable. Smartphone is not only for communication devices but also used for news ,pictures,videos,tv,and information, function as personal media devices for entertainment.That is also used as a means to express their individuality. It is used to negotiate independence from parents in certain areas of life and also used to support intimate relations.None of this would be possible without chemistry, and every time you use your cell phone, you are putting chemistry into action.Thanks to the intersection of chemistry and innovation, the possibilities are limitless. Thank you for reading,we hope this article is helpful.If you have any questions ,please comment below.